Cosmetics and pharmaceutical drug delivery systems could be improved thanks to a new method developed to precisely measure the capability of capsule-like biological membranes to change shape under external stress. This work is outlined in a study published in EPJE by Philippe Méléard and Tanja Pott from the Rennes-based Institute of Chemical Sciences at the European University of Brittany and their colleagues from the Center for Biomembrane Physics at the University of Southern Denmark in Odense. EPJ E - How do protein binding sites stay dry in water? In a report that has just been published in EPJE, researchers from the National University of the South in Bahía Blanca, Argentina studied the condition for model cavity and tunnel structures resembling the binding sites of proteins to stay dry without losing their ability to react, a prerequisite for proteins to establish stable interactions with other proteins in water. EPJ E - What makes tires grip the road on a rainy day? 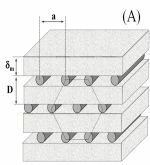 A team of scientists from Italy and Germany has recently developed a model to predict the friction occurring when a rough surface in wet conditions (such as a road on a rainy day) is in sliding contact with a rubber material (such as a car tire tread block) in an article that has just been published in EPJE. One important message that has emerged from developments of effective field theories and effective Hamiltonians for nuclear physics is that many-body forces are inevitable whenever degrees of freedom are eliminated. At the same time, first-principles calculations have shown that two-body forces alone are not able to give an accurate account of the energies of light nuclei and the saturation of nuclear matter. Three- (and possibly more-) body forces are thus essential in low-energy nuclear physics. "Supersymmetry - to be or not to be?" remains a still unanswered question - it is a traditionally difficult business to demonstrate a zero result in experimental physics - yet the ATLAS collaboration has just set new and very stringent limitations on the "viability space" of a class of new physics models incorporating gauge-mediated supersymmetry breaking. Scientists from the University of Vienna’s Faculty of Physics in Austria recently gave a theoretical description of teleportation phenomena in sub-atomic scale physical systems, in a publication in the European Physical Journal D.
For the first time, the Austrian team proved that mathematical tools give us the freedom to choose how to separate out the constituting matter of a complex physical system by selectively analysing its so-called quantum state. That is the state in which the system is found when performing measurement, which can either be entangled or not. Spontaneous ordering of DNA fragments in a special matrix holds the key to creating non-toxic gene therapy delivery vectors, according to a study recently published in the European Physical Journal E.
Scientists from the CNRS Paul Pascal Research Centre, an institute of the University of Bordeaux, France, and colleagues from the Institute of Physics at the University of Sao Paolo, have created a complex system designed to hold DNA fragments in solution between the hydrophilic layers of a matrix of fatty substances (also known as lipids) combined with a surfactant (used to soften the layers’ rigidity). One possible application that has yet to be tested is gene therapy. The twin paradox has been a source of debate since it was discovered by Einstein. It can be analytically verified assuming the existence of global nonrotating inertial frames. The natural nonrotating frame and its identification with "fixed stars" is an aspect of Mach's Principle, which holds that the totality of matter in the universe determines the inertial frames. Cartoon of the Minimal Walking Technicolor Model extension of the SM. At present there are no known elementary scalar fields. A possible candidate is the as yet undiscovered Higgs particle; however it could well be that this elusive particle is instead composite. This possibility is exhaustively examined in this article, which is both tutorial and extensive review, classifying the diverse technicolor models as extensions of the Standard Model of particle physics. The activity of online communities does not grow in line with the number of users, according to a model recently published in the European Physical Journal B. The Internet has given rise to its own sorting devices. Among these, tagging consists in assigning user-chosen keywords to a piece of information (such as a digital image) to facilitate searches. Lingfei Wu, a researcher at the City University of Hong Kong’s Department of Media and Communication, used the tagging behaviour of social media application users to study the growth of online communities’ activity. Thank you very much, Isabelle! Very timely. And the cover looks fantastic! We are grateful for the great collaboration! Best wishes.